The menu ribbon of the Add-In1 allows you to insert one or more barcodes into an Excel2 spreadsheet with one click. 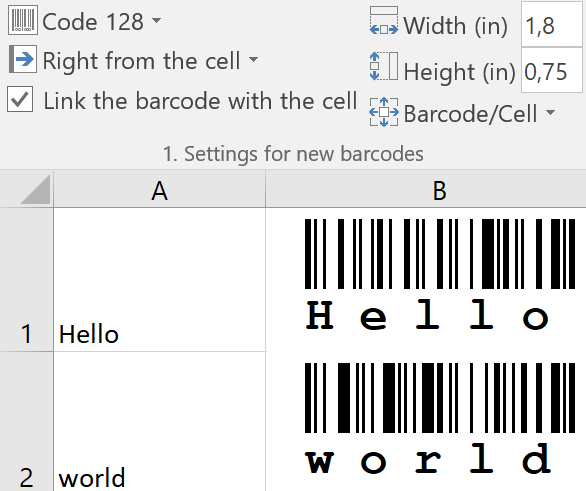 You can create barcodes that take the value of a cell and optionally change automatically if the value of the linked cell changes. In the first group you define the desired settings for the barcodes to be generated. You select the type of barcode from the list, select the position and size of the barcode and determine whether the barcode should be linked to a cell. The List of Types allows you to select from the list of all supported barcodes. If you would like more information about the individual barcode types from within Excel, you can also find them directly under the button Manual rightmost in the menu. Positioning the barcodes: Right, Left, Above or Under sets the barcode to be created relative to the cell for which a barcode is to be inserted. Onto the cell sets the barcode to be created exactly on the cell for which a barcode is to be inserted and thus covers this cell. Free position allows you to determine the exact position of a barcode to be inserted. When inserting, the barcode is first stored in the center of the worksheet and can then be moved. Check Show the human readable text if you want a human readable text to be displayed with the barcode. This setting can also be changed later for each inserted barcode object. Please note that some barcode types such as Data Matrix do not display a human readable text because it does not belong to the specification. Barcode/Cell defines the behavior that is desired when barcodes are inserted in relation to the barcode and cell size. Barcode size independent of the cell size allows the barcode to be inserted without any influence on the cell size. Select Set cell size like Barcode size if you want to automatically adjust the size of the cell to the selected size of the barcode when inserting the barcode. The selected barcode size determines the resulting cell size. With the last setting Set barcode size like cell size, the existing cell size specifies the size of the barcodes to be inserted. 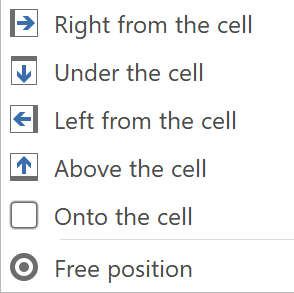 If you choose this setting, you should first resize the cells to the desired size so that the generated barcodes have enough space. Width (in) and Height (in) Here you can specify the width and height for new barcodes in inch or centimenter depending on your system settings for metrics dimmension. These fields are only available if the other settings allow this information. 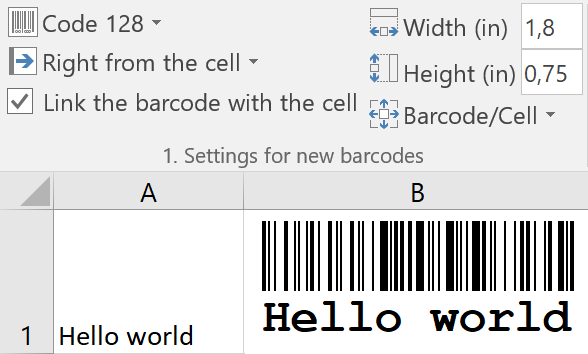 Single Barcode: Move the cursor to the desired cell that is to be used as a source for the barcode and click the button from the Barcode group. The barcode is inserted and the cell content is used as text for the barcode. If the cell is empty, the content of the barcode to be created is queried beforehand. Multiple Barcodes3: If you select several cells, multiple barcodes are created according to the previously defined settings. For example, if you have selected one hundred cells in a column with product numbers and set that barcodes of a certain size should be inserted to the right of the cell and the cell should be adapted to the size of the barcode, you will get a list with one hundred barcodes in the desired size as shown in the screenshot. In the third group, optional or additional functions are available that allow subsequent changes to the barcodes previously inserted or special functions such as inserting as a static image. Design mode: Switches the design mode on and off. If the design mode is enabled, you can click on barcode objects and a frame around the barcode object will be displayed. You can then move barcodes, resize them and change their properties using the context-sensitive menu (right mouse button, ActiveBarcode object, Properties). If you deactivate the unlock mode, the frame is no longer displayed and the barcode objects are better protected against changes. Properties: Opens the Properties window which displays all properties tabularly. With active design mode, all properties for barcode objects can be retrieved by clicking on a barcode while this properties window is open. Show code: Opens the VBA Code Editor for developers. Text: The two-part button allows you to change the barcode text for the selected barcode in the upper area. In the lower area a menu is offered that has further functions for changing the barcode text: The barcode text can be set to a demo text which is useful for starting the selected barcode type with a valid demo. 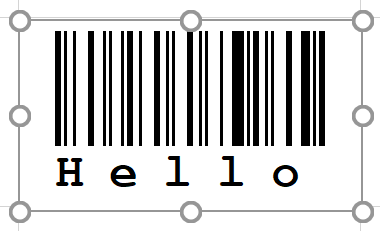 The plain text line for the barcode can be switched on and off and the size can be changed. Minimum size: Allows shrinking to the smallest possible size for which the barcode is still valid. Delete: Deletes the selected barcode. Insert image: Inserts a barcode as an image. Unlike when inserting a barcode object, the barcode cannot be changed any more. If the image is resized, a loss of quality is possible. This function should only be used in exceptional situations and is usually not recommended to be used if a solution can also be solved by inserting a barcode object. Further Step-by-step manuals guide you quickly to the desired solution. Support directly from the developers. If you have any questions about the add-in, please contact us. Individual adaptation and extension of the add-in according to your needs. 3 This function is available from version 1.8.0 of the Add-In. Always make sure to use the latest version.